As a consultant it’s feast or famine. While there’s feasting you work all hours, when there’s famine you can go out and sow the crops, for me that means harvesting sand dollars, beach walks, writing music, just thinking and being. Usually the holidays is a slower time for me, so in order to take advantage and be sure I am duly stressed I like to throw a party for 80 plus and take the opportunity to explore my “Martha Stewart” side. I put my multitasking to the test and challenge myself to what seems like a marathon of planning for the party which of course runs for more than 12 hours, starting at 5pm and this year ending at 6:30am with some guitar playing. This was the 12th annual party, and over the years I have created a series of lists to keep myself organized, but this year I was given a copy of Bento, a fantastic program made by the folks that made Filemaker, that has been very helpful to me both in party planning as well as in my work life. I don’t often review software, but I was already very excited to try it as I am VERY familiar with Filemaker. I have used Filemaker since 1993 when I started working at Windows on the World as Wine School Coordinator. It was a great program used by the former administrators, including Andrea Immer Robinson to keep track of wine school attendees. I remember being fascinated by its versatility, remember computers were somewhat new at the time, at least I still didn’t even have my own computer! I still use Filemaker today for invoicing, mail merges and for my database of addresses so when I saw Bento I wasn’t as sure what the difference was. It has taken me a while to get used to it but now that I have I find it is extremely useful. 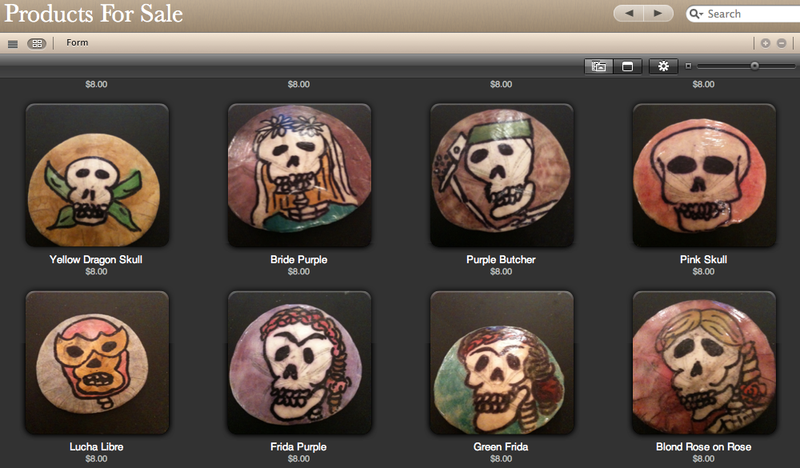 I love to do crafts and a few years ago was supplied with a gift from the sea of sand dollars. Previously I would find partial or broken sand dollars but I kept finding perfect sand dollars on the beach. As I collected I figured I would have to find something creative to do with them. So I started painting them with the Day of the Dead themes as well as the Virgen de Guadalupe. Now that I have many of these in stock that I sell and I needed a way to deal with these. Of course I love lists so it only made sense to inventory them. Bento offers a great resource to do this including photos of all of your items. Additionally you can sync Bento with Bento for iPhone so that this inventory can be on hand at all times. I also decided it was time to get my act together in terms of my “collections” as part of the anti-hoarding campaign (Hoarders has scared me straight) so I have been able to make lists of the wines in my cellar, the collection of wine glasses I have for classes, and even my collection of wine books and magazines (anyone want a few hundred old Wine Spectator issues? Now what do I do with those?). Sometimes when shopping I need resources, so I have lists that are easily accessible from my iPhone of everything from sizes for my husband’s clothes, lists of which crochet needles I already have, lists of supplies, lists of songs or albums I want to buy or songs to sing at karaoke, lists of songs to learn for open mic. Lists upon lists upon lists! I make quite a few things for both my holiday party as well as Christmas Eve and so to keep things straight is a challenge. I am still reworking the way I have the lists set up in Bento but Bento is definitely helping me organize! I list the dishes I am going to be making and am working on and list where I need to pick up the ingredients since of course I have favorite places to buy certain things. 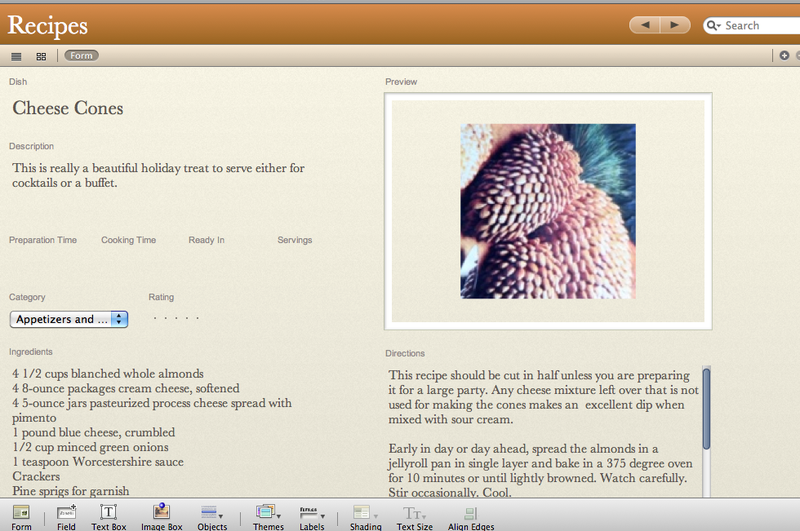 There are multiple templates you can download for free, for example one for recipes that helps you organize and even take photos of those recipes, here I have a cheesy recipe from my mom… They also have a template exchange, so folks that create a cool template can share them online. Bento also offers fun templates like Beer Hunter where you can review beers and remember your favorites, although I don’t think you will see me whipping out my iPhone to do that at the Toronado, but maybe I would at City Beer Store. Of course they also have wine review templates and I have found that it has made it easier for me to track samples that I receive to review. 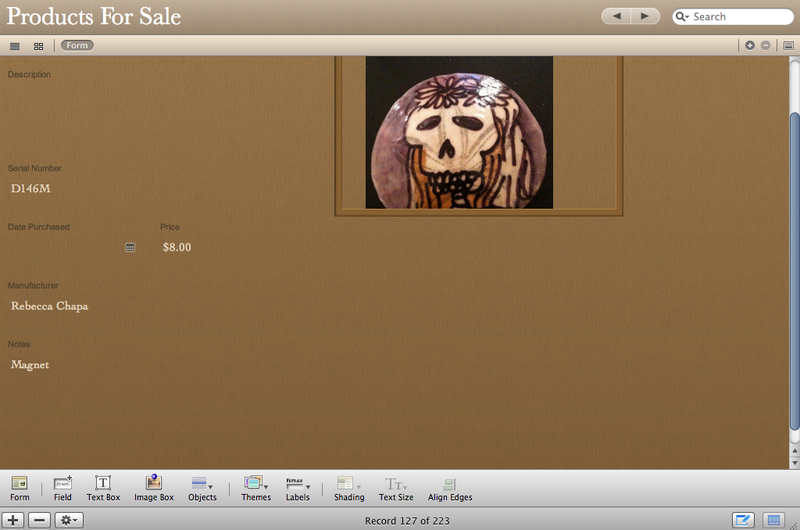 Bento really does much of what Excel can do but with a snazzier more visual look since you can add photos. Of course it syncs to your iPhone so all these lists are always handy. For those in sales Bento has a great template that allows you to monitor your communications with potential clients and manage them. So although I really like the old school lists that I have lying around I found myself pulling up my recipes on my iPhone while cooking this year, the only drawback? A really greasy iPhone. Happy Holidays!